Many owners of older dogs with hazy eyes get told that their dog has cataracts, and then live in fear of their dogs going blind. The truth is most of these dogs have nothing of the sort. After reading this, you can be the one to correct the next giver of bad advice. 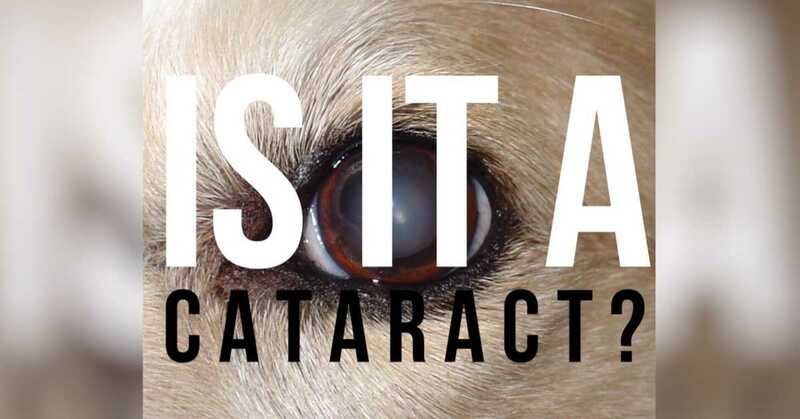 Cataracts do happen in dogs and are probably at least as common as in people. When they occur they are very important, both as common causes ofbindness and signs of other important diseases such as diabetes and progressive retinal atrophy (PRA). However, the vast majority of dogs said to have a cataract instead have ‘senile nuclear sclerosis’ (or lenticular sclerosis). This is the condition which proves to me more than any other that we are not supposed to live forever. What Is Senile or Lenticular Sclerosis? As we age, our lenses continue to create new layers from the inside of their capsule. This creates an onion-like effect, with older layers moving towards the centre. The problem is that despite the new lens material being produced on the edge, the lens cannot get any bigger. Therefore, the lens becomes more and more dense in its centre, or nucleus. 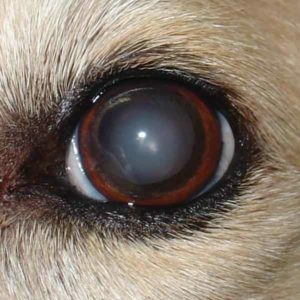 By about 8 years of age, this dense nucleus starts getting visible, and as the dog ages it reflects more light, giving the dog’s eyes a bluish-grey look as in the picture above. The trick is that most light still goes straight through as normal and the dog’s sight is hardly affected if at all. 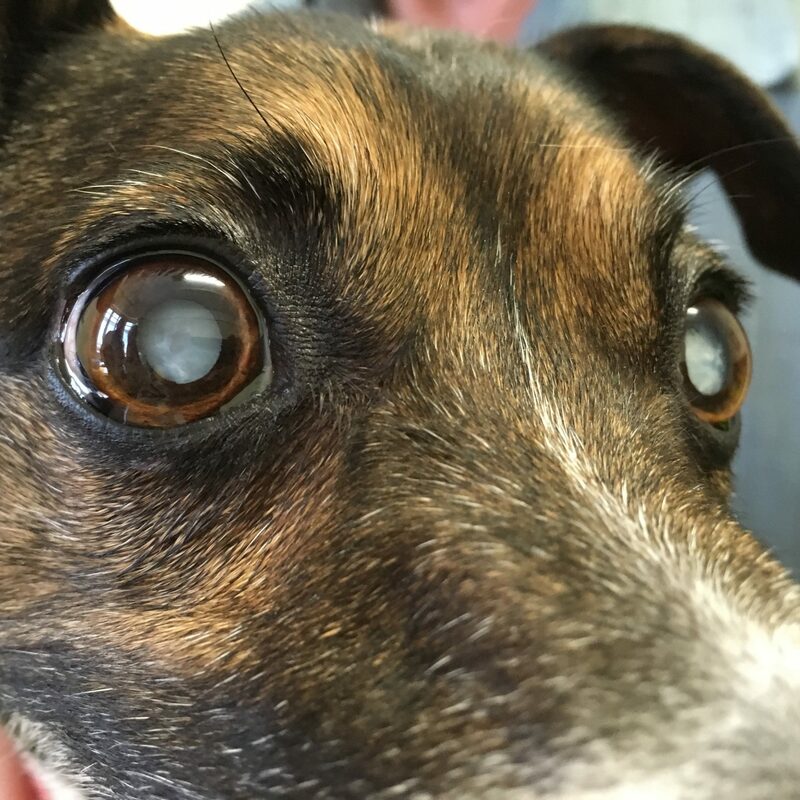 It only takes a quick visit for a vet to tell the difference by seeing if the retina is visible (as in nuclear sclerosis) or not (as in the cataracts seen here). You can also see in this picture of mature cataracts how the lens has irregularities and it much whiter than the earlier picture. 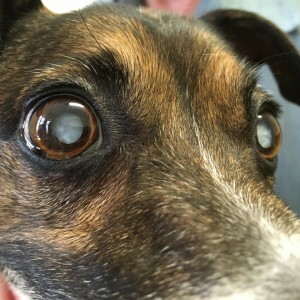 If you are concerned by advice from others about your dog’s eyes having cataracts, please don’t lose sleep as it is much more likely that they are wrong. However, do make an appointment with your vet just to be sure. Cataracts eventually cause blindness but can be removed by a vet eye specialist to restore vision. That’s what the pictured dog had after this photo. Another myth worth tackling is that a dog going blind is a big problem. Most owners don’t notice their dog’s blindness, and the dogs don’t seem to mind as long as they can sniff their way through the day. If all this sounds a bit blasé, try to see the world from a dog’s point of view. Unlike humans, vision is probably their third most important sense. If you really feel like messing with your mind, read more here on this concept of ‘umwelt’. It might just change how you see animals! My dog is 3 years old and i took him to the vet and one of his eye has Cataract.. How worry should i be and should he get surgery to remove it? Hi Andre- that’s very unusual in such a young dog. It’s certainly something I would get checked by a vet eye specialist. The decision on whether to operate will depend on what is causing the cataract and what the chances are of the other eye having the same problem. If it’s only one eye, a dog will do just fine without surgery.